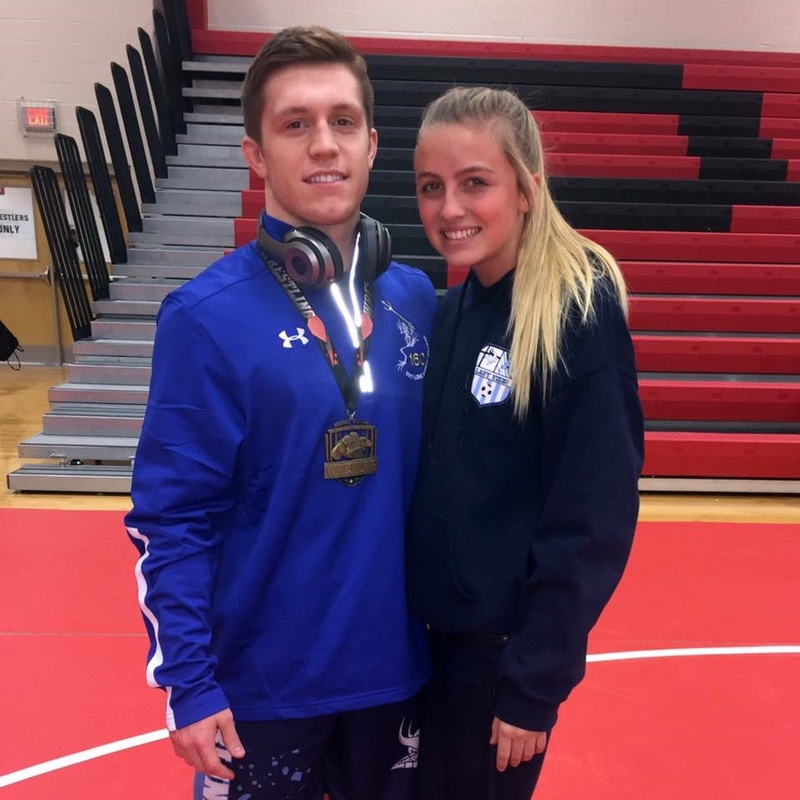 NOTE: The Scott Rohrer Hoover Invitational, a regularly scheduled event for Catholic High School, was cancelled due to inclement weather. 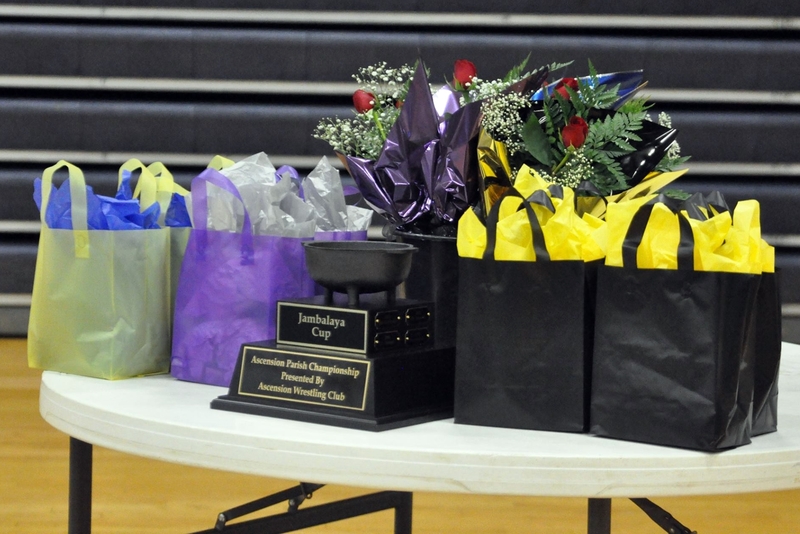 The St. Amant Gators won their third consecutive Jambalaya Cup on December 31st at East Ascension High School. The Gators defeated Dutchtown 41-12 and East Ascension 46-21. East Ascension defeated Dutchtown 44-25. 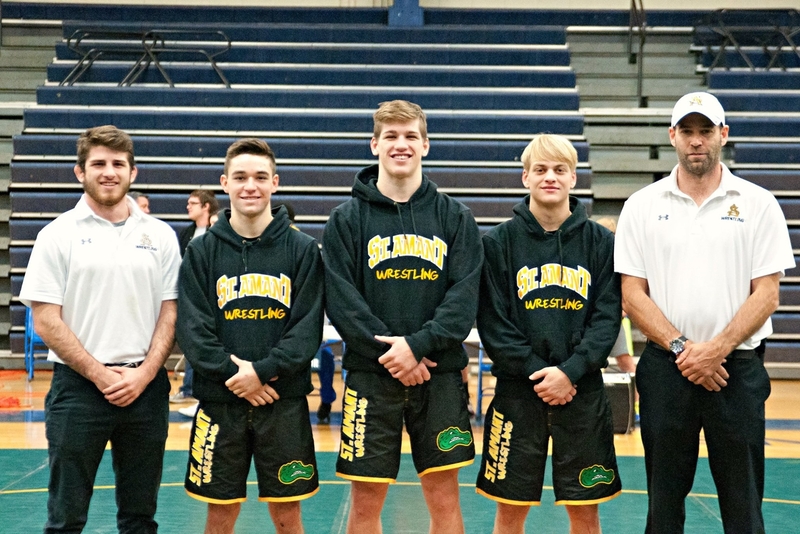 At right, Assistant coach Josh Averette, Brier Babin, Sage Nugent, Cameron Hyde and Coach Brian Hess of St. Amant. 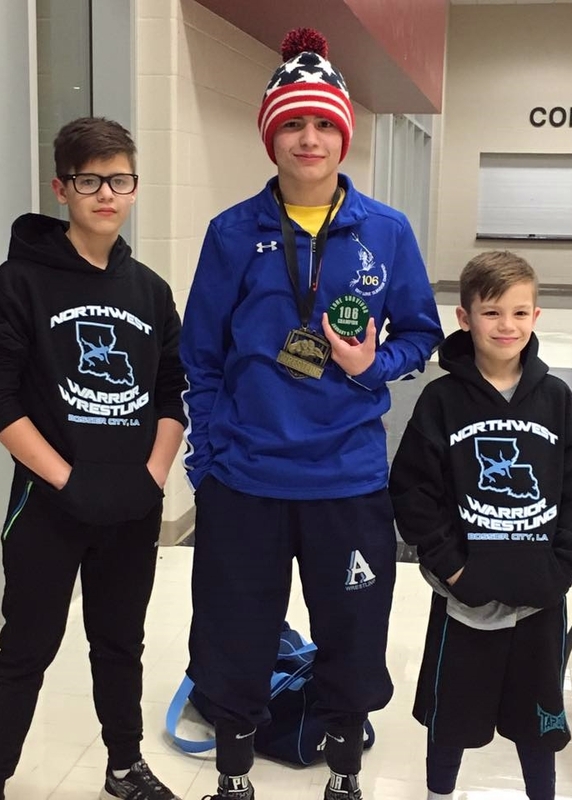 Joshua Wright (left) was undefeated, including a 12-1 win over East Ascension's talented freshman Trent Mahoney. 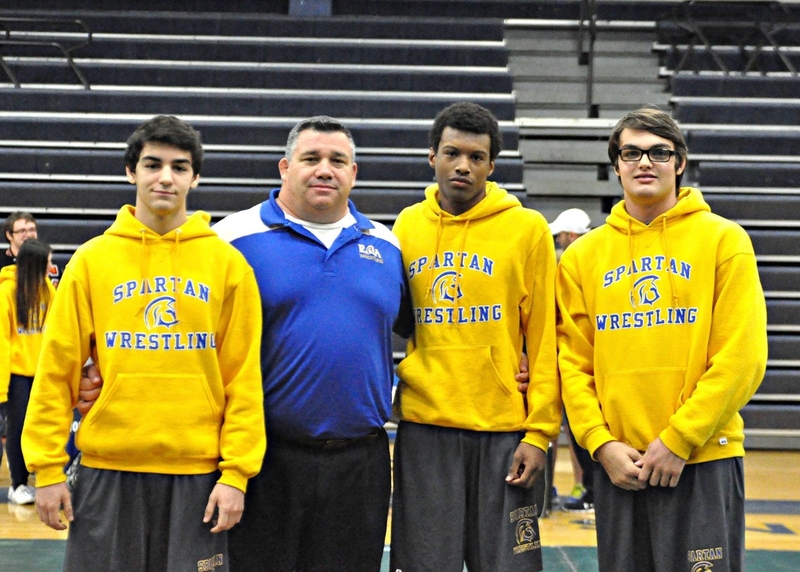 Mason Gonzales, Coach Pat Mahoney, Kevin Jones and Sidney Mitchell. 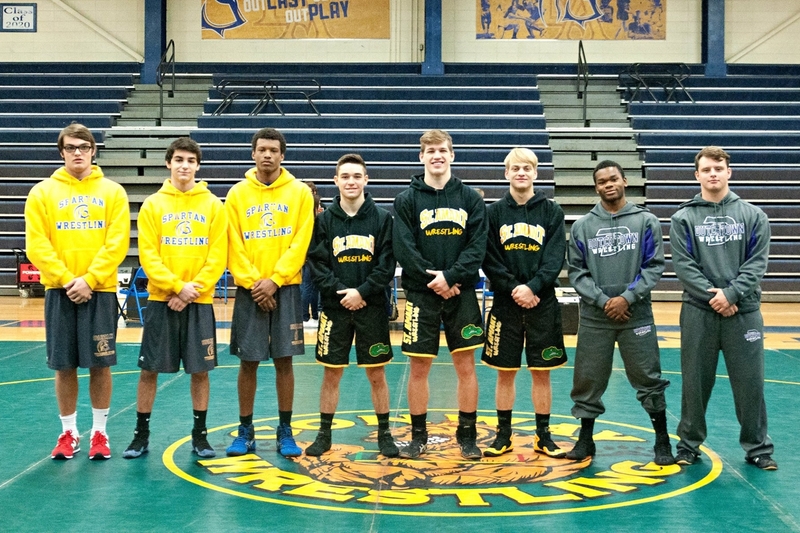 Graduating seniors from East Ascension, St. Amant and Dutchtown. 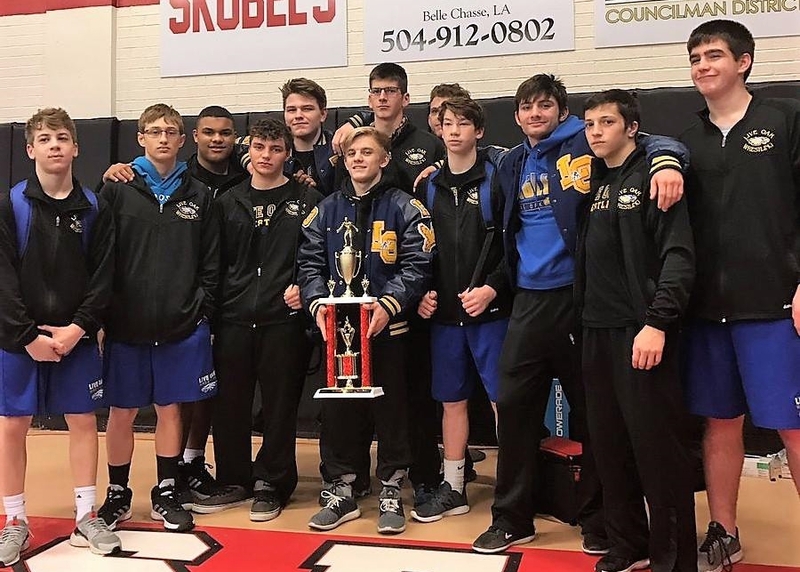 By the smallest possible margin, the Comeaux Spartans won the Greg Lavergne Lafayette Parish duals championship for the second consecutive year. Comeaux defeated Acadiana 60-18, Carencro 57-24, Teurlings Catholic 37-36, Northside 70-12 and Lafayette 64-4. 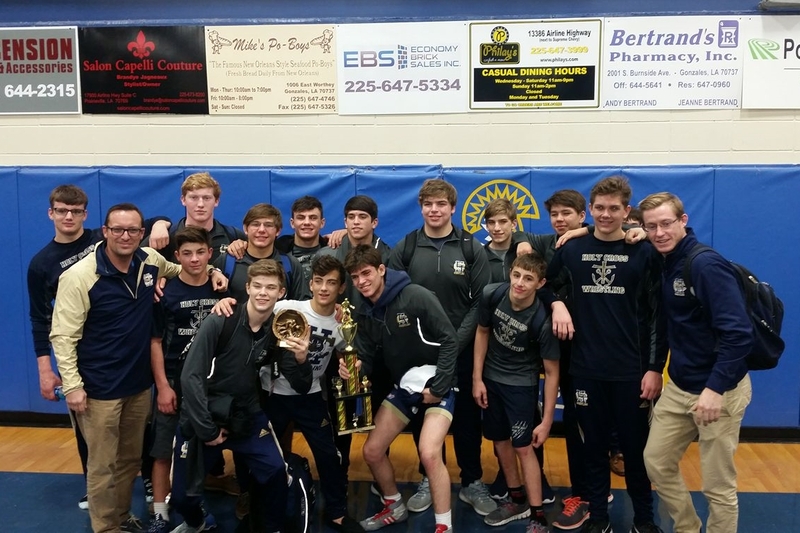 In the third round of the duals Comeaux outscored Teurlings Catholic, the only team to beat the Spartans in 15 years (2015), 37-36. Comeaux locked-up the win with Dylon Bernard's (photo right) pin of Jackson LeBlanc in 1:58. That gave Comeaux a seven-point lead with one match remaining. 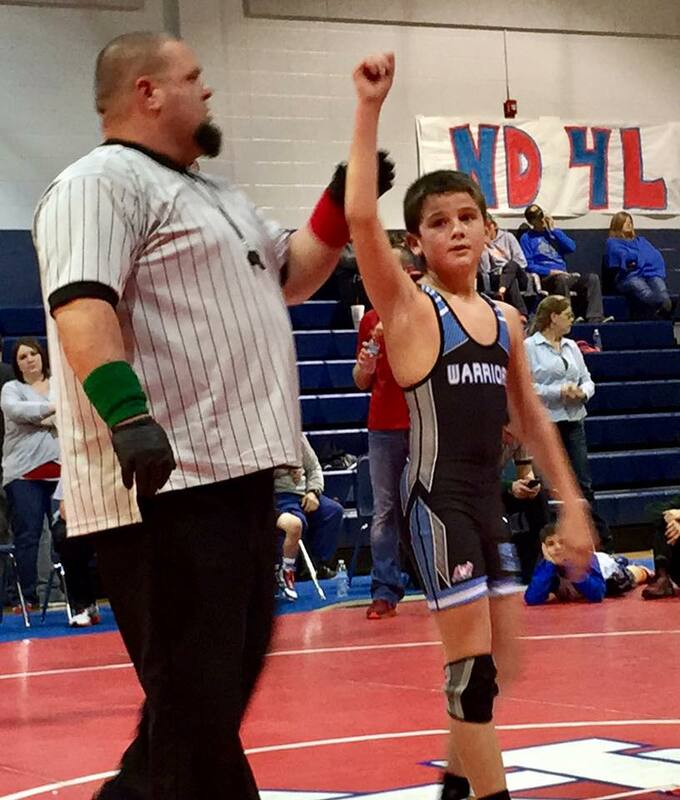 The last match went to Teurlings via a 0:29 pin of Randy Boudreaux by the Rebels' Josh Hebert. Each team had seven wins. 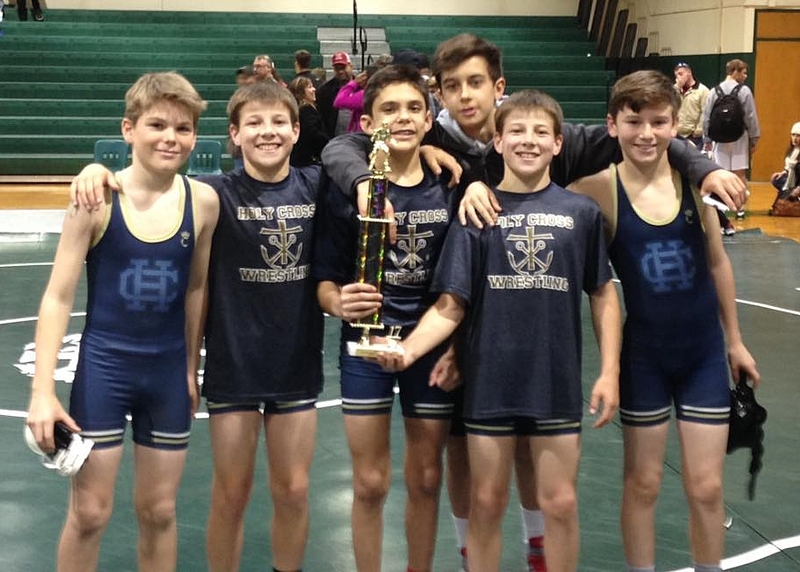 Teurlings Catholic had five falls to Comeaux's four, and the match came down to bonus points. 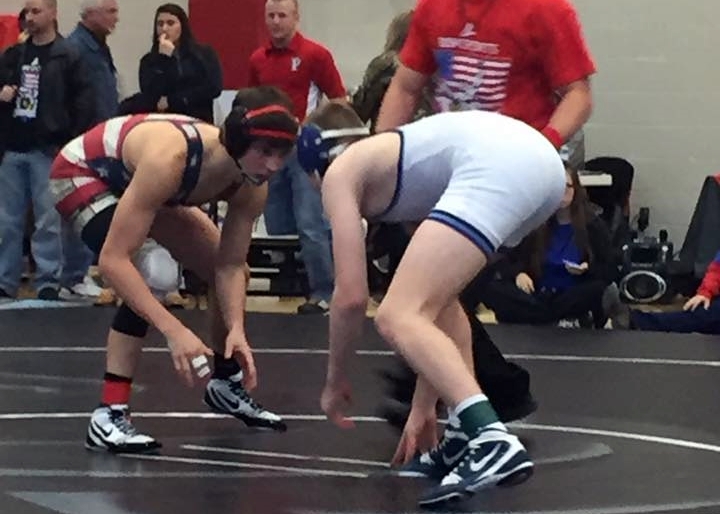 Hadley Trahan scored a 13-3 major decision (one bonus point), as did Shelby Savoie in a 15-4 match (one bonus point). 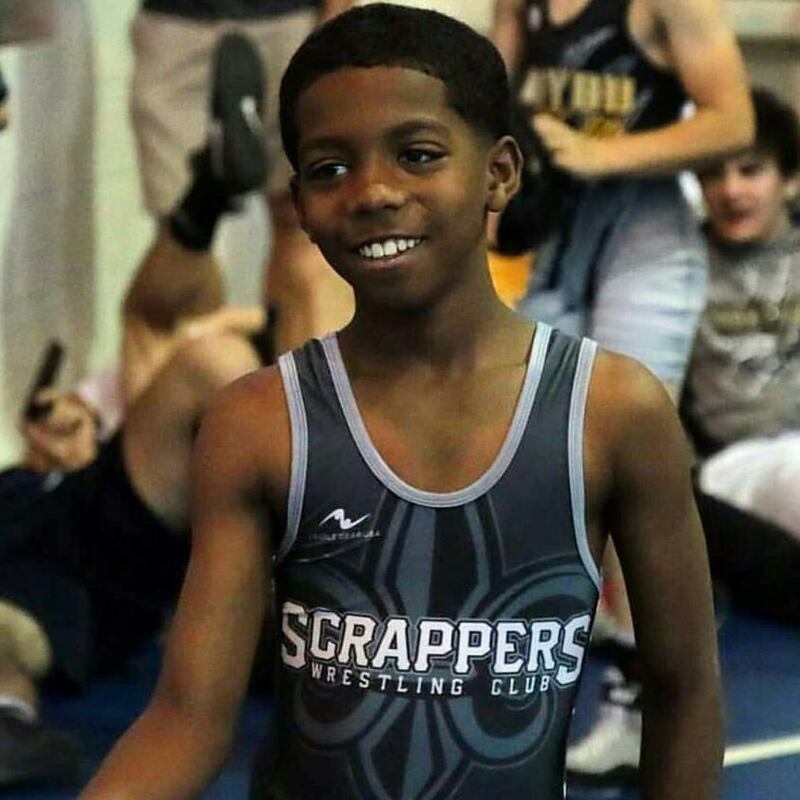 Dylan Ames scored a 23-6 technical fall (two bonus points) to give Bernard a chance to put the match away with a fall. The four bonus points scored by the Spartans were just enough to cover the Teurlings pin by Josh Hebert in the last match. 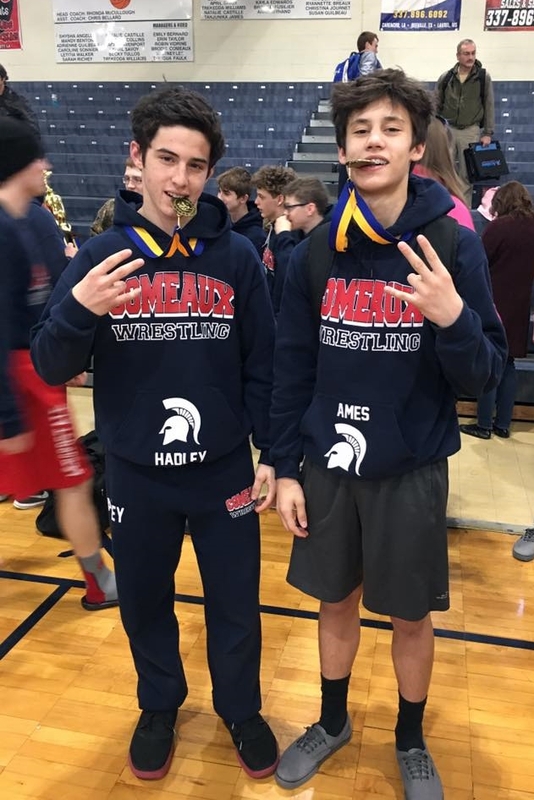 At left are Spartans Hadley Trahan and Dylan Ames. The Airline Vikings are, for now the top team in north Louisiana. 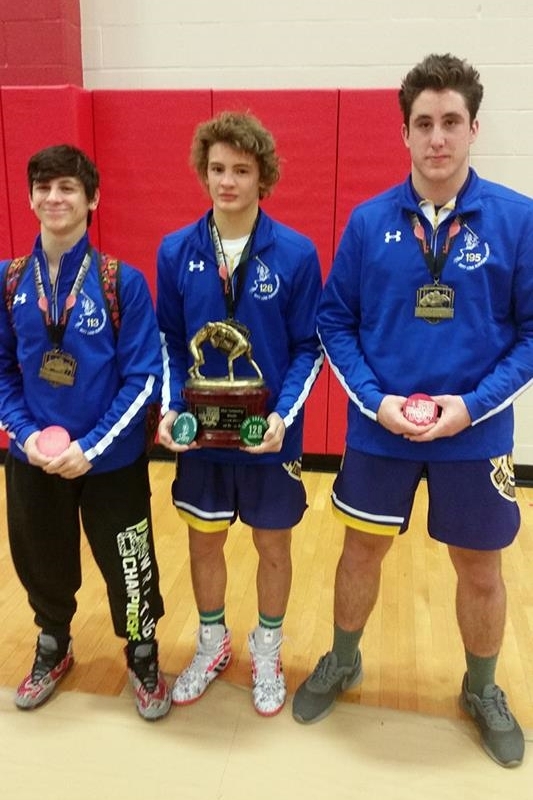 The Vikings had split championships with the Parkway Panthers in the Eagle Open and Riot on the Red tournaments. Tied at 96.5 at the end of the first day, Airline stormed ahead on Saturday and won with 360 points, 20 points more than the runner-up Panthers. 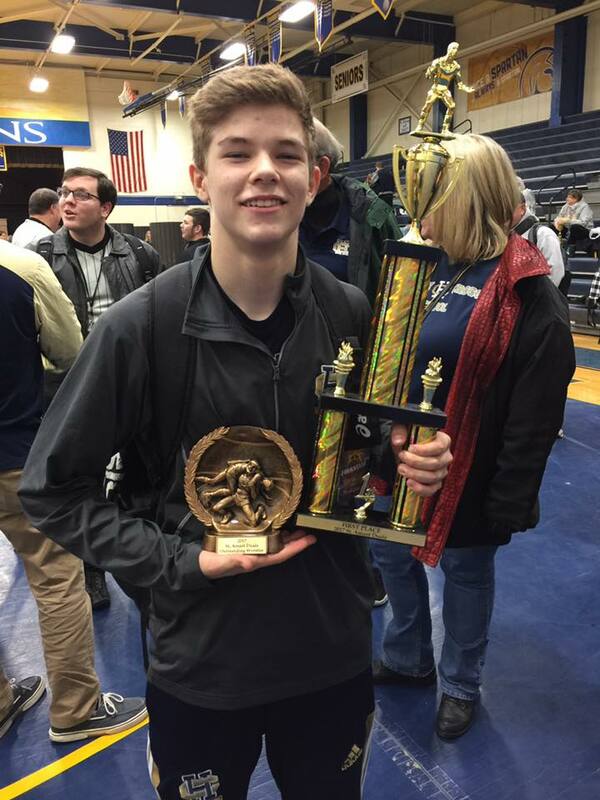 The Vikings earned championship points by Dakota Brace, Tucker Almond, Christian Walden and Darrell Evans, runner-up points scored by Tyler Eckman, Josh Partin and Matt Salinas, third-place points by Peyton Bass and Alex Davilia, and fourth-place points by Thomas Barringer and Paul Zaulda. 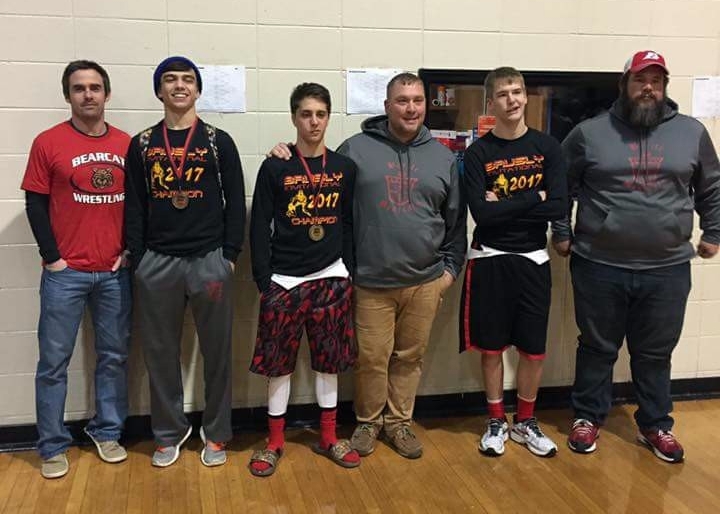 For Parkway, championships were won by Matthew Pitts, Ryan Huckaby and Dalton Driggers. 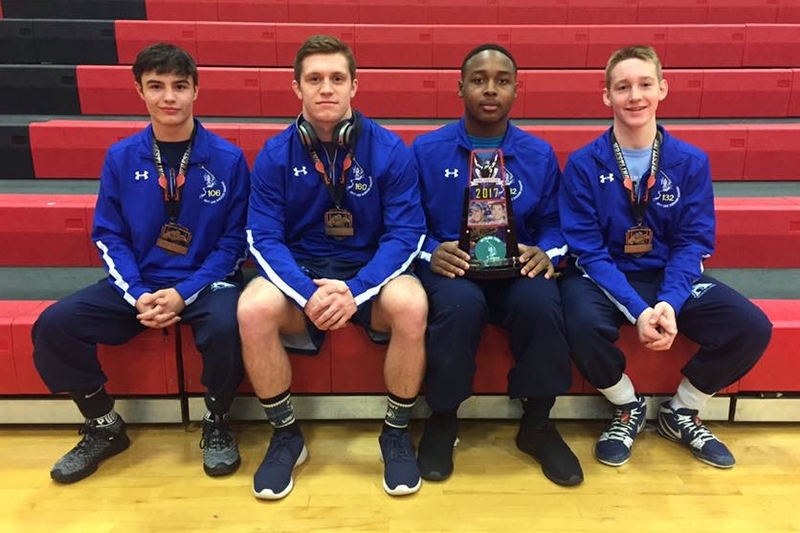 Runners-up for the Panthers were Joshua Keeler, Zachary Harper, Trey Fontenot and Trevor Tamburo. 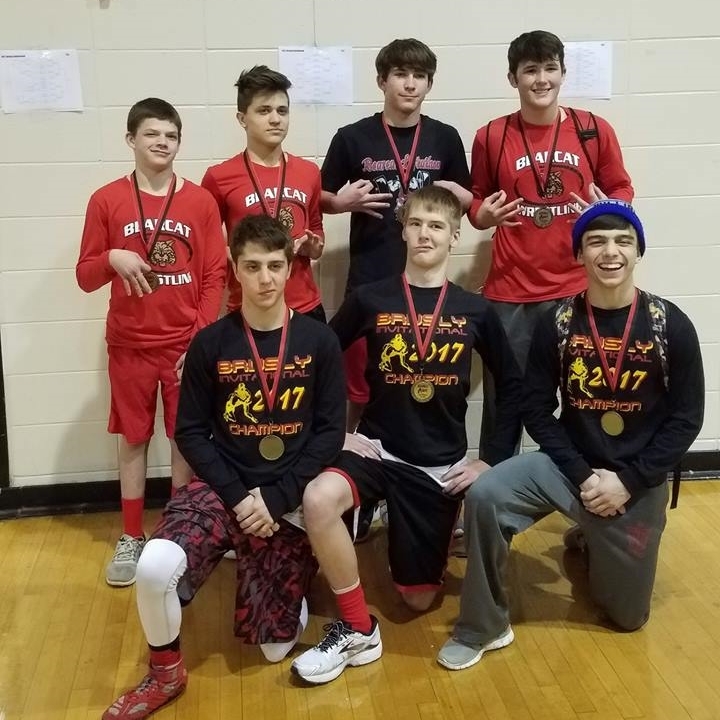 Jarden James, Chandler Crawford, William Jicks, Haroon Wali and Coltin Marras each placed third. 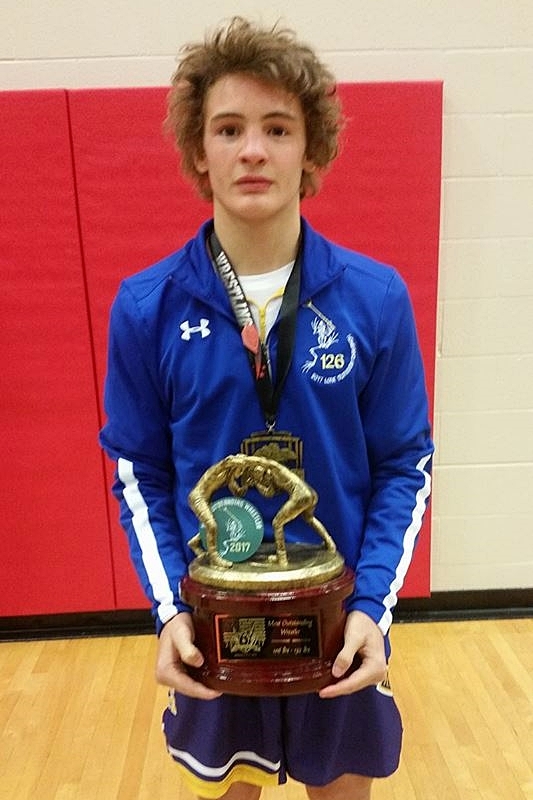 Kneeling is Darian Mitchel, who placed first and was voted the Outstanding Wrestler in the heavier weight classes. 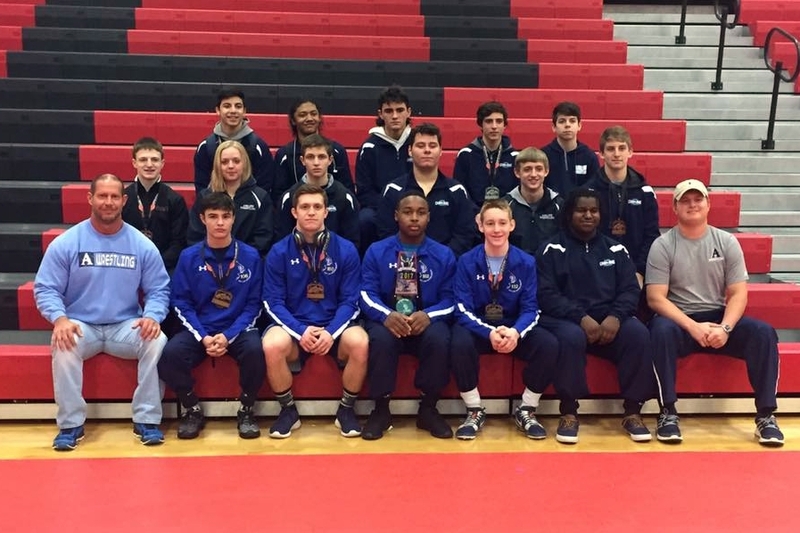 (Bottom row, left-to-right) Dakota Brace (Airline), Cooper Simon (Rayne), Christian Satchell (Sam Houston), Morgan Manuel (Rayne), Tucker Almond (Airline), Matthew Pitts (Parkway), Ryan Huckaby (Parkway); (top row, left-to-right) Dalton Driggers (Parkway), Christian Walden (Airline), Jordan Miles (Benton), Darrell Evans (Airline), Tyler Carriere (Rayne), Darian Mitchell (Barbe) and D.J. Harvey (Lakeside). 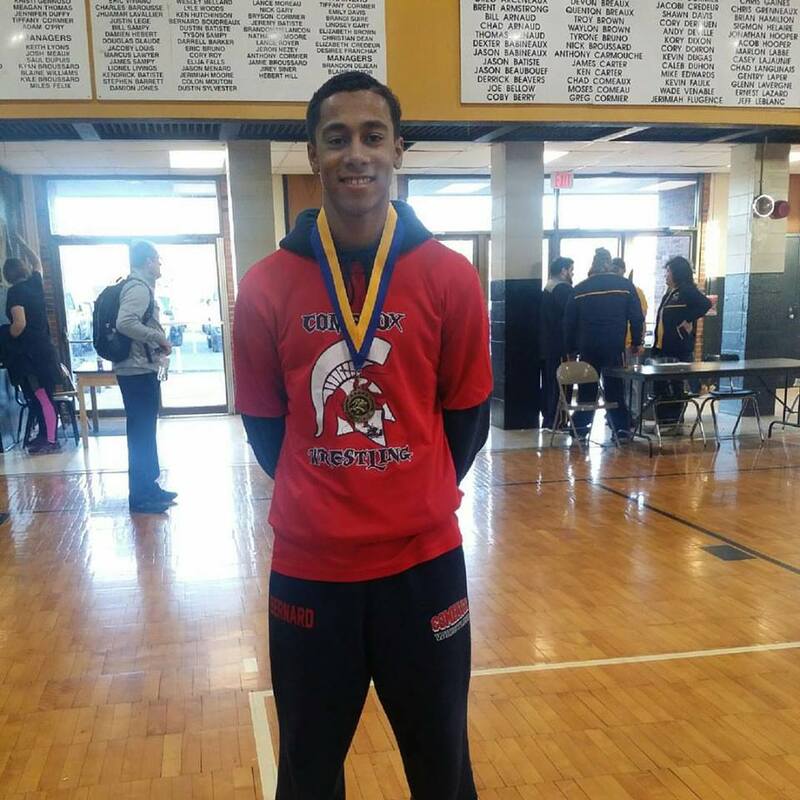 De la Salle once again established themselves as the favorite to repeat as Division III team champions at the Brusly Invitational The Cavaliers scored 205 points, which was 41.5 more than runner-up Brusly. 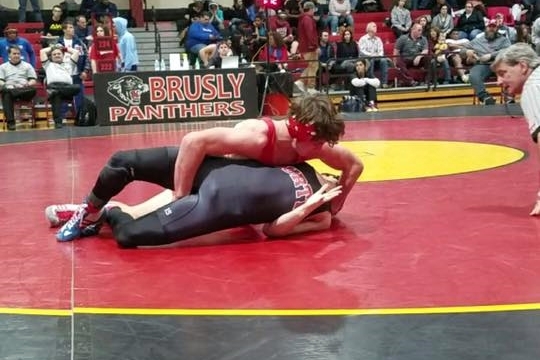 The Cavaliers had four champions and two runners-up while Brusly had four champions and two runners-up. 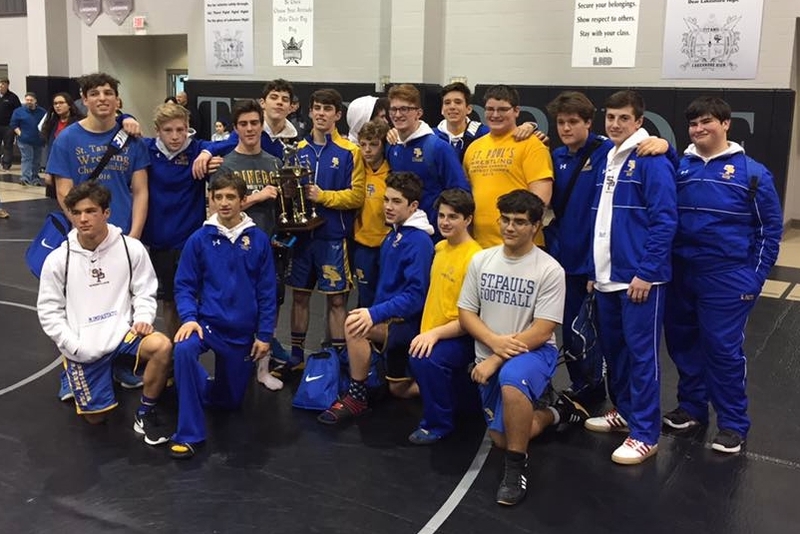 Live Oak won the Belle Chasse Cardinal Duals, beating Belle Chasse in a close 39-36 match. Belle Chasse got past Rummel by a mere point, 40-39, for a chance to meet the Eagles. Live Oak also defeated Central 48-27, Chalmette 42-36 and Hahnville 51-30. 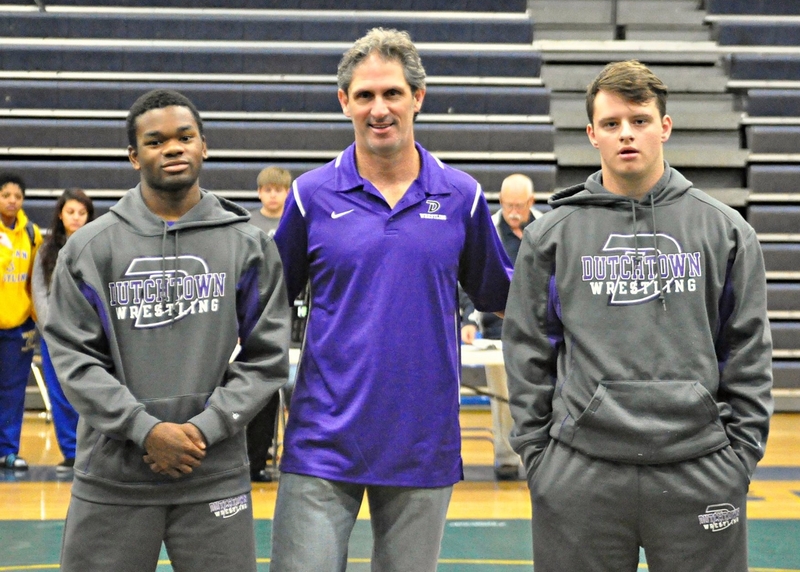 Not surprisingly, the Saint Paul's Wolves (left) won the District 6-5A duals on the Northshore. The Wolves have won the title every year since its inception in 2009. The Wolves defeated Archbishop Hannan 7-6, Covington 72-12, Fontainebleau 55-21, Lakeshore 84-0 and Mandeville 67-9. 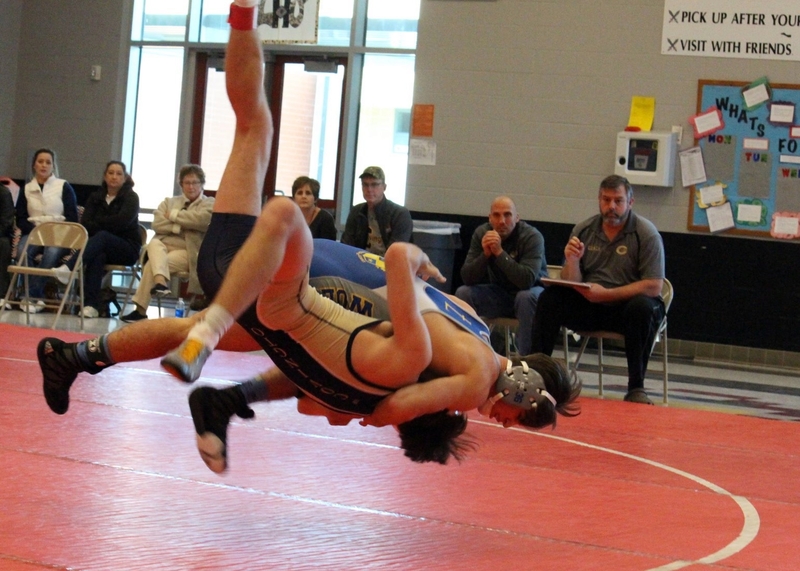 Jared Thieler (right) takes his Covington opponent off of the ground. 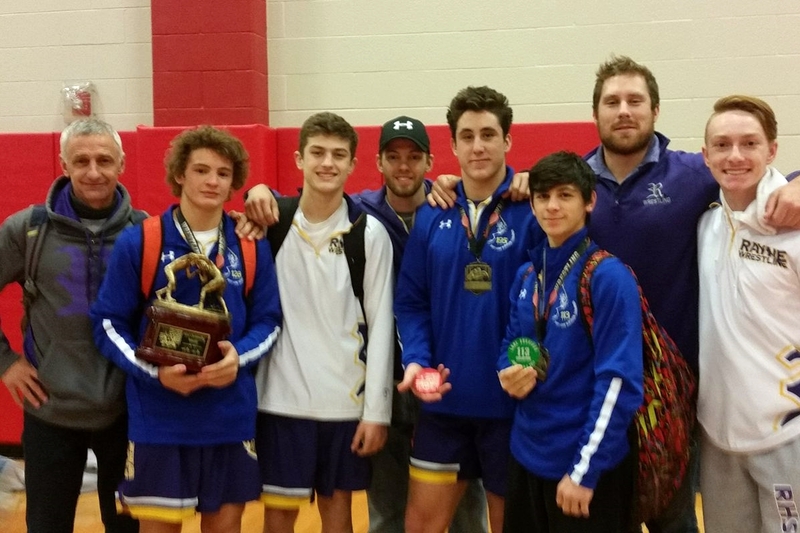 Holy Cross won the St. Amant Duals, which were held last Saturday at East Ascension. The Tigers defeated the Gators 52-15 for the title. Prior to that the Tigers defeated St. Michael 72-4, East Jefferson 80-0, Zachary 78-6 and East Ascension 67-5. 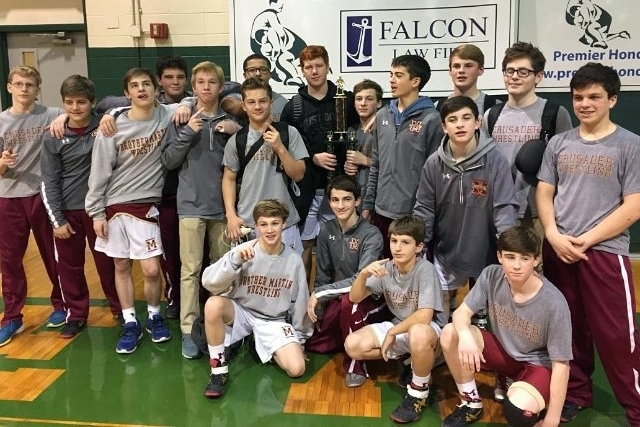 At the District 9-5A Junior High Championships held at Archbishop Shaw on Saturday, the Brother Martin Crusaders took first place, followed by the Holy Cross Tigers. 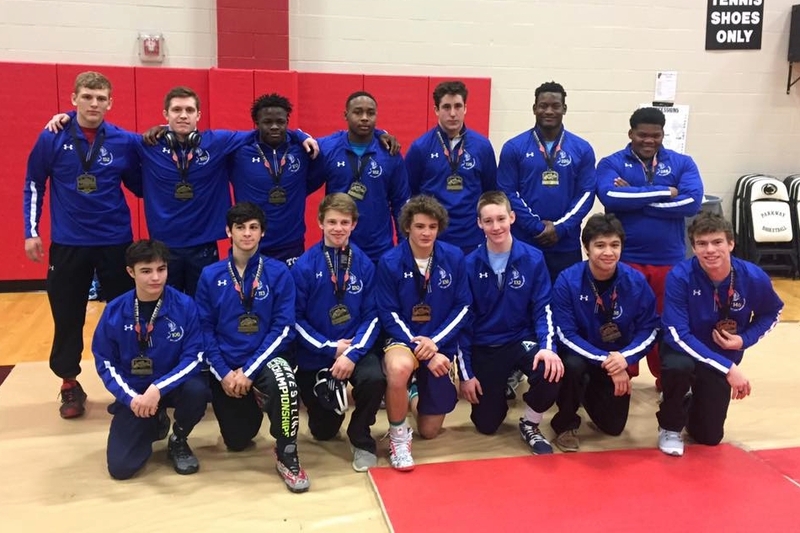 The Brother Martin Crusaders travelled to Texas for the Grapevine Duals. In Friday's pool rounds, the Crusaders beat their competition by scores of 38-28, 70-4, 75-061-12 and 58-15. 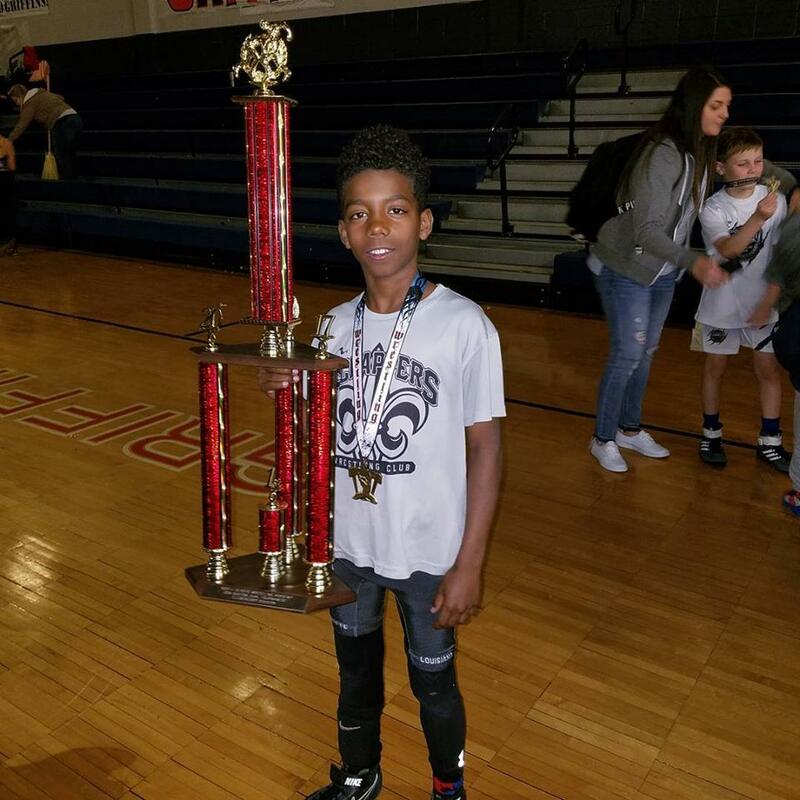 In the championship bracket event held on Saturday, the Crusaders defeated Silver, New Mexico 54-12, Frisco Liberty Heights 55-13 and Belen, TX 51-19 for the championship.